Apple is known for its innovation and coming up with new intuitive ways of interacting with our devices, and a patent outlined by AppleInsider gives a glimpse of another example of pure class engineering. 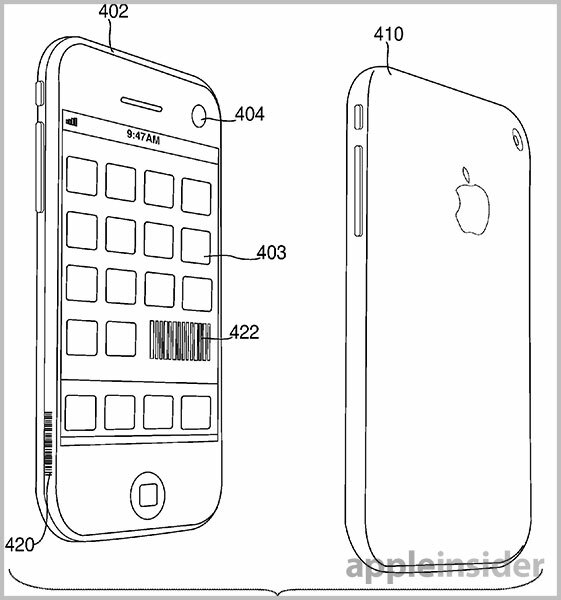 The U.S. Patent and Trademark Office published Apple’s U.S. Patent No. 8,429,407 for “Digital handshake between devices,” which details creating a secure connection between two devices simply by taking a picture of an image of the other device to generate a digital handshake key. Most content transfer between devices is done using SMS or Email, where contacts, texts, documents, video, music, and more are all shared. Bluetooth or WiFi transfer have recently become more popular methods of transfer but there are still limitations that make quickly transferring a file a tedious job. Apple’s new patent provides a way for two devices to communicate by generating an on-the-fly key by taking a picture of an image unique to that device. The images in the patent show a dynamic image displayed on the screen, or a barcode type image embedded in the casing or bezel itself. A process follows that generates a digital handshake key by using the device-provided key or seed with the key captured in the image. This process can support multiple devices, with more dynamically added by using the same initially generated key. For added protection, a device can require a user-generated code to connect. Further, if there are multiple devices in a captured image, a device can intelligently parse out which is requesting a key through location, distance and content displayed onscreen. The integration of such a feature would rely on a special chip in the camera that can be used to identify such a marking and generate the key and then allow a connection, so the chances of seeing this in the iPhone 5S are very slim, but a very cool feature non-the-less.